Card members at this consumer retail bank, enjoy a large variety of products and services. The bank offers standard banking transactions, credit cards, insurance, and investment products. After the 2008 financial crisis, the bank experienced a sharp decline in overall customer satisfaction, and also learned that its customers were more empowered than before. 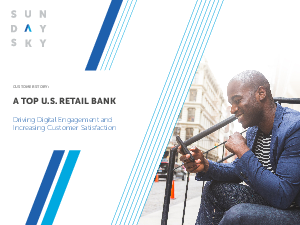 SundaySky SmartVideo enables the bank to take a strategic approach to enhancing the customer engagement process with personalized video experiences that welcome new card members and assist them in fully understanding how to get the most out of their new product.